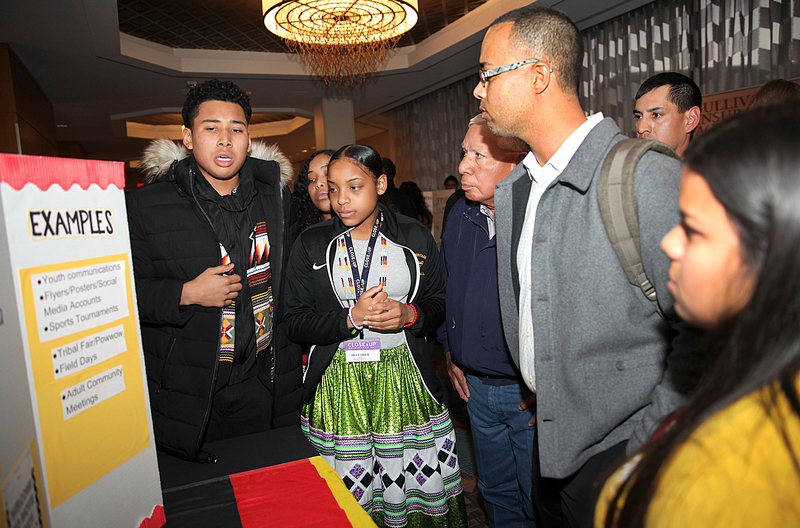 WASHINGTON — The Seminole Tribe of Florida had the largest contingent of students in the annual Close Up and United South and Eastern Tribes program from March 2-8 in Washington, D.C. Out of the 98 high school students from 17 tribes who participated, 24 were Seminoles. 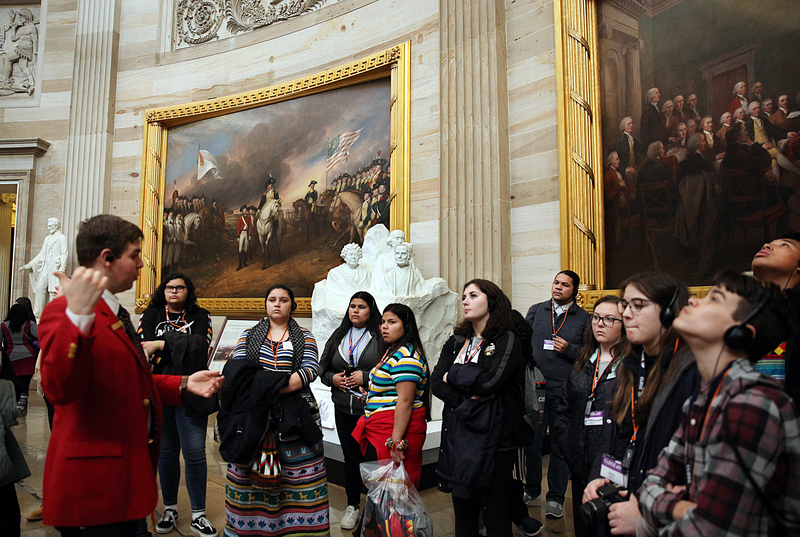 Although the students toured the U.S. Capitol and a variety of historic monuments, the Close Up USET program was much more than a sightseeing trip. Students spent the week learning about U.S. and tribal governments while working together to address specific issues affecting their individual tribes as well as the meaning of sovereignty for all tribes. In addition to Florida, Close Up USET students represented tribes from Maine, Rhode Island, Connecticut, New York, North Carolina, South Carolina, Alabama, Louisiana and Texas. Many Seminole youth wore patchwork all week, which provided a burst of color to the grey winter landscape of Washington, D.C., and nearby Alexandria, Virginia, where most of the workshops were held. An important part of the week was learning and practicing leadership skills. 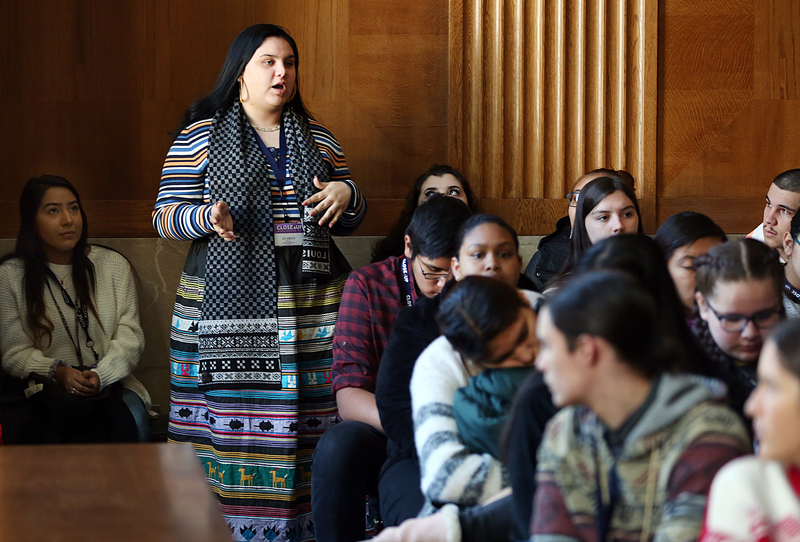 Through workshops where the students worked together to write initiatives and sovereignty statements, they learned how to compromise, pare down large issues and listen to each other. The initiatives and sovereignty statements were debated in small groups, written and rewritten and then presented to the USET leadership during organization’s USET Impact Week. By the end of the week, students had experienced what it takes to tackle important issues together. Each tribe brainstormed together March 4 to create tribal action initiatives built around a central issue facing their tribe, write a statement about it and offer solutions. First, each Seminole student wrote what he or she considered to be an important issue. The group discussed them all before deciding that a lack of involvement by youth in the Tribe would be the central issue. The USET leader advised the kids to try not to be too negative, but to focus on ways the Tribe could improve their issue. The discussion veered toward culture, lack of communication and treatment of descendants. They agreed that without youth involvement in the Tribe’s culture, it would disappear. Some mentioned the Tribe’s decision to stop sending kids to Camp Kulaqua – a summer program that has resumed this year after a hiatus – and the cancellation of the wellness conference, which were both activities that brought together a large number of youth from all reservations. They noted that sports tournaments are also ways to gather together and those are promoted well by the Tribe. The conversation led to the importance of communication with youth. Instagram and other social networks kids use frequently were mentioned as effective ways to reach them. 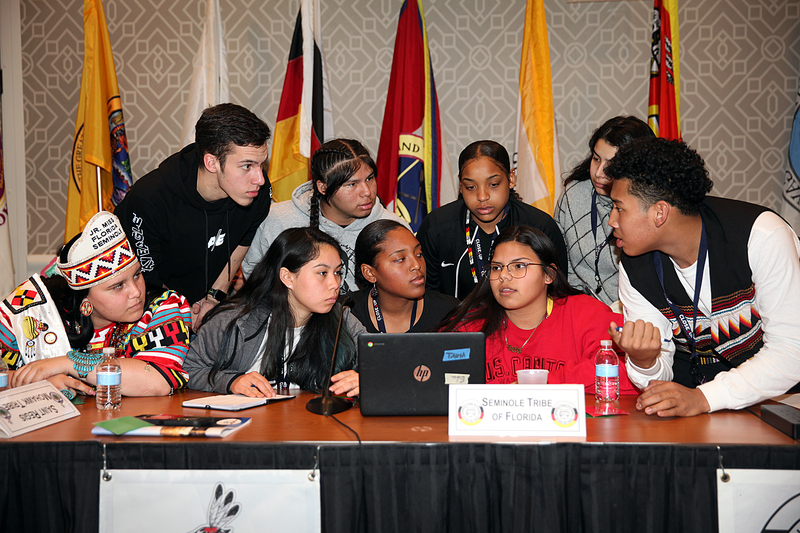 From these discussions, the Seminole students’ issue statement, solutions and examples were written and displayed with those of the other tribes at the USET reception that evening. Some solutions offered were youth groups, informal announcements, community events, use of social media to advertise and holidays. Examples given were youth communications, flyers/posters/social media, sports tournaments, Tribal Fair and Pow Wow, along with field days and adult community meetings. At the reception, crowds perused each of the boards and asked the students about their initiatives. At the Seminole table, Brighton Councilman Andrew J. Bowers Jr. and Andrew Jordan Bowers, executive director of operations, asked students about their initiative and how they planned to implement it. Andrew Jordan Bowers noted the inclusion of a youth council on the display board and asked if having one would allow them to elect representatives to speak on everyone’s behalf. It was clear the students didn’t want to wait until they were 18 to participate in the conversation with tribal leaders. The group was serious about starting youth councils on every reservation to get all Seminole youth involved. 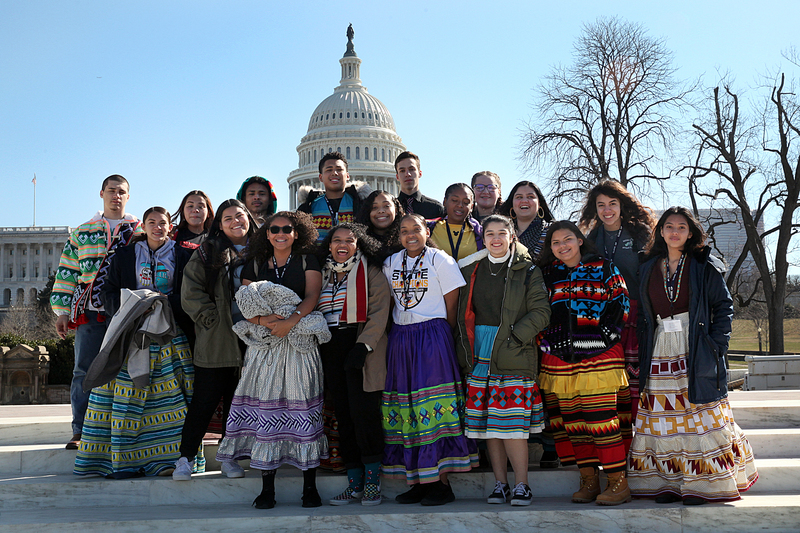 After posing for the traditional Close Up USET photo op with the distinctive Capitol dome in the background March 5, the group walked to the Dirksen Senate Office Building to meet with staff members of the Senate Committee on Indian Affairs. All 13 members on the committee hail from states with Native American tribes. The committee is charged with studying the unique problems of American Indian, Native Hawaiian and Alaska Natives and proposing legislation to alleviate those difficulties. Issues include education, economic development, land management, trust responsibilities, healthcare and claims against the United States. The committee also works with other committees to encourage them to take Indian Country into consideration for all bills. All 98 students, their chaperones and Close Up USET leaders filled the stately hearing room. On one side of the high-ceilinged, wood paneled room was a large u-shaped conference table around which were committee chairs. Behind those large executive chairs was a bench along the wall, where the staff members sit during hearings. On this day, the staff sat at the long table in front of the committee chairs and faced the group. After introductions, the staff invited the students to ask questions. 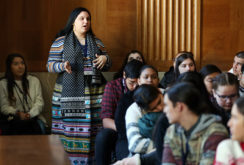 One wanted to know what the committee was doing about legislation in regard to missing and murdered Indian women. The first question set the tone for the session; it was clear the students did their homework. The answer was somewhat complicated. The committee held hearings in December 2018 and hopes the Savanna Act, named for a 22-year-old woman who was murdered in North Dakota, will be passed during the current session of Congress. The bill would require the Department of Justice’s U.S. Attorneys meet annually with Tribes to report sexual violence against women and other violent crimes, give training and technical assistance to tribal police and share crime data. The committee tries to work in a non-partisan fashion, since most issues affect everyone. Indeed, the victimization rate against women is the highest in the U.S. in Indian Country. Clarice Demayo, 15, asked what the committee was doing for tribal poverty rates. The committee looks at what economic development tools are available to tribes and provides tribal leaders with information. It’s up to those leaders to decide what avenues to pursue. One opportunity is Native American business incubators and grants to help entrepreneurs turn their ideas into businesses. The committee also supports investing in workforce development, including education, as a way to help future generations achieve economic prosperity. A discussion about how to keep kids in school and off drugs ensued. 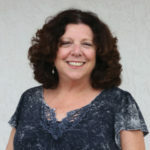 One staffer had worked extensively on the issue and said it was important to make sure students have the resources they need to get to school and thrive at school, including food, housing, access to healthcare and transportation. Making sure schools expect students to succeed and having quality educators at those schools are equally important components for success. Chandler Demayo, 18, asked if the committee had plans to address climate change in Indian Country. Although the committee doesn’t address that directly, Co-Chairman Senator Tom Udall’s key areas of expertise are climate change, environmental regulation and reform. There is no pending legislation that addresses climate change. The staffers talked about what it was like to be a Native American working on Capitol Hill and told the students to get involved with their Tribes and get to know their federal representatives and senators. The students adjourned for lunch in the Senate cafeteria, followed by tours of the U.S. Capitol, Supreme Court and Library of Congress. For the final project of the week, students wrote a sovereignty statement. They were divided into six workshop groups comprised of students from various tribes. Each workshop collaborated on an overall statement and addressed three key topics: education, economic development, and culture and language. At the end of the day the large group would vote on which of the six statements would be presented to USET. Before the students started working, USET Director of Environmental Resource Management Jerry Pardilla began the discussion with some frank talk about sovereignty. There are 573 federally recognized tribes in the U.S. and each one is a sovereign nation. Pardilla told the group that sovereignty is about possessing, asserting and carrying out distinct rights of a person and a nation of people. It is a legal status with inherent rights and powers which cannot be granted or taken away. Federal agencies still have trust responsibilities over tribal land throughout the U.S.
With those words in their heads, the students buckled down to write their sovereignty statements. A methodical process with specific steps and activities was used to help them organize their thoughts. Exercises such as stating the first word that pops into their minds when they think of sovereignty, defining sovereignty in their own words and listing what they discussed throughout the week about the topic helped them mold their sovereignty statements. Sovereignty has many meanings, so the definitions were varied among the students and the groups. The students gave thoughtful consideration to the issue of sovereignty as they came up with ideas for the statement. They talked about who is impacted by a lack of sovereignty, what would happen if their tribes were to lose it, what sovereignty looks like now and in the future and what can USET do to ensure it is maintained. These questions were answered in each group’s final sovereignty statement. Once the statements were written, each workshop elected a representative to speak for the group at the USET meeting. The group convened in a ballroom lined with tribal flags and set up in a large U so everyone had a clear view of each other. Group leaders read the sovereignty statements, the groups discussed the merits of each and they voted on which ones would be presented at the USET Council Session the following day. USET adults sat in the audience and observed the process. At the USET Council Session the following day, March 7, the sovereignty statements were entered into the USET record and will be included in its annual report. In remarks to the students, USET leaders told them how impressive they are and urged them to share what they learned with their peers at home. “The best part of the week was speaking to people from other tribes and seeing how their conflicts compare to ours. I saw how privileged Seminoles are and how we as youth sometimes take advantage of that. It’s been a real eye opener,” said Carlise Bermudez, 14. “The process of writing and being on the panel when we shared our sovereignty statements was important. That’s how adults get things done; they get together and share their opinions. I like that the youth got to do that,” said Lena Stubbs, 16. “I liked the Indian Affairs Committee. We were able to get answers on problems we wondered about. It expanded my knowledge on the subject,” said Skye Stubbs, 14. “Writing the sovereign statement was the highlight. Everything we learned throughout the week was incorporated in that one statement and activity,” said Clarice Demayo, 15. “I want to become more involved in politics, but Washington is too busy. Maybe I’ll run for youth council. I want to get youth more involved with decisions the Tribe makes and give a youth perspective. The youth is the future foundation of the Tribe,” said Leanne Diaz, 15.